A quarterly report from Metrostudy says Dallas-Fort Worth new home construction was up 7 percent, and closings on new homes up 9 percent, in the third quarter July, August, September, compared with the second quarter. And housing starts were up 6 percent from the same period last year. Analysts now says the market is coming down off the post-home buyer tax credit bottom that occurred in the first quarter of 2011, almost like withdrawal. David Brown, director of Metrostudy’s Dallas-Fort Worth office, says he continues to hear that sales are sneaking higher than for the same months of 2010. Home builders closed sales of 3,805 new homes from July to September, and started construction on 3,839 homes. Last week I told you about the “sweet spot” of pricing on new home sales up in Allen. Hillwood broke ground on the last phase of Twin Creeks; StarCreek and other Allen developers are breaking ground and moving dirt like crazy, I caught up with Hillwood’s president, Fred Balda, who told me it’s not surprising, in times like these, to see consumer home demand in the great master planned communities. It also helps that we have jobs in Texas, particularly tech jobs, drawing in buyers. Last year, says Balda, Hillwood, with 60 major residential master-planned communities across the continental U.S, Hawaii and Costa Rica, only started 300 new lots in Dallas Fort Worth. Tough year. This year, the company has doubled the number here. In the golden years of the boom peak, Hillwood was churning out 1500 lots a year in D/FW. It’s not just jobs: another Allen draw, says Balda, is great schools, especially “one neat high school that is like a mini-college.” There’s great retail, shopping and restaurants. Twin Creeks is the tail end of a development started back in 1993; only 60 lots left to develop, then it’s a completed community adding to the heft of Allen. As a city, Allen saw 425 new home starts in the last 12 months. There are about 800 lots on the ground right now, or an 18 month supply. Equilibrium for this area is 24 months, says Balda, so Allen is actually below equilibrium. And Balda agrees: the sweet spot of home sales in this area is below one million. When I asked where the buyers are coming from, he said 20 to 25% are move up buyers coming from other parts of the market — moving away from the private schools, perhaps? — as well as relocations. And the upscale dirt here is not too shabby when it comes to sales. 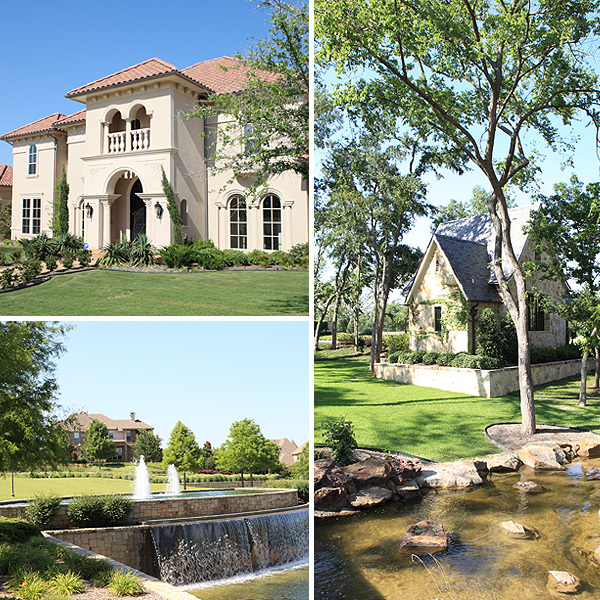 The only gated area in Twin Creeks is exclusive Wimberley, where sales are also cooking. Wimberley’s lots are larger and pricier, with homes ranging from $1 million to $3 million: only 50 left to sell. Who’s buying? Upscale buyers — remember, there are plenty of them — businesspeople and professionals who love the hillier terrain and living near ponds and creeks. I’m just glad to see the dirt flying.